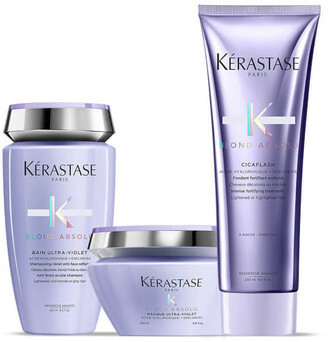 Restore the vibrancy of blonde hair with KÃ©rastase Blond Absolu Ultra Violet Shampoo, Masque and Conditioner Trio ; a three-piece set of haircare treats formulated specially for blonde tresses. Designed to fend off unwanted brassiness for icy cool blonde locks, the trio work in synergy to cleanse, treat, nourish and fortify for silky-smooth hair that shines bright. The Set Contains: Blond Absolu Bain Ultra-Violet Anti-Brass Purple Shampoo (250ml) A deeply nourishing hair cleanser that boosts luminosity. The purple shampoo works to deliver lasting protection against brassy and yellow tones, whilst defending against pollution and other external aggressors to maintain a healthy, natural-looking shine. Hyaluronic Acid and Edelweiss Flower work in harmony to melt away dirt and excess oil and replenish hydration, leading to a silky-soft and vibrant head of hair. Blond Absolu Ultra Violet Masque (200ml) A weekly hair mask for lightened and highlighted locks. The purple formula helps to banish brassy and yellow tones while protecting against dullness caused by pollution and other environmental aggressors. Hyaluronic Acid and Edelweiss Flower combine to deliver high levels of soothing moisture, rebuilding weak hair fibres and infusing strands with a healthy, salon-worthy gloss. Blond Absolu Cicaflash Intense Fortifying Treatment (250ml) A weightless and luxurious formula that delivers the deep nourishment of a hair mask. The shimmery gel is infused with Hyaluronic Acid and Edelweiss Flower to replenish intense hydration to every strand, rebuilding and strengthening the fibre to minimise breakage. The conditioner helps to create smoother, softer and silkier hair with a radiant finish.